Marcel Bloch, famous French aircraft designer prior to the fall of France to Germany, adopted the covert name used by his brother in the underground and become Marcel Dassault. After producing a number of combat aircraft designs building on the captured knowledge of WW2 German aviation research, Dassault turned to the challenge of developing a Mach 2 interceptor that would keep France in step with aircraft developments in Britain, USSR and the United States. The result of the Mach 2 design effort was the delta-winged Mirage III which first flew in 1956. Since that successful milestone, the Mirage has evolved into a capable fighter, fighter-bomber, reconnaissance aircraft, and more. The Mirage IIIC in particular was designed as an all-weather interceptor that could perform ground attack missions in daylight. 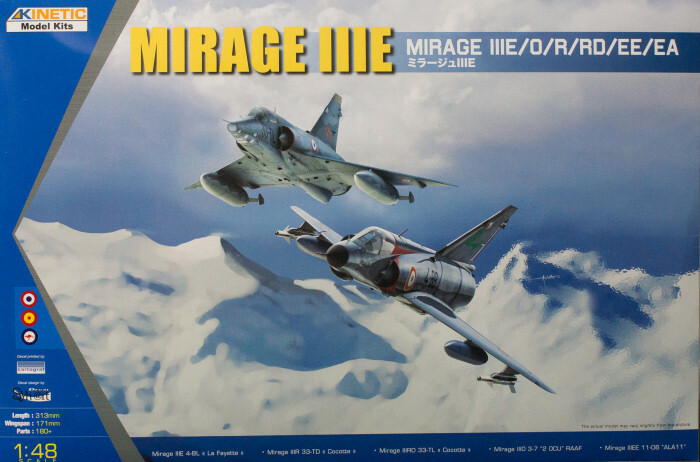 Kinetic Models is back with the first new-tool Mirage III airframe since Eduard's brief Mirage IIIC releases about ten years ago (and HobbyBoss' similar kits that followed). This time we have the Mirage IIIE airframe which has a longer fuselage than the Mirage IIIC and is designed as a multi-role fighter and opens the way to a wide range of possible variants. This kit is molded in light gray styrene and presented on 15 parts trees (duplicate trees not shown), plus a single tree of clear parts. These decals are nicely done and include a nice suite of airframe stenciling and weapons markings. Painting instructions are provided using FS equivalents and Humbrol paints. You can see in the parts images how the kit is modular with small trees for variant-specific parts which likely means we'll be seeing other Mirage III and perhaps Mirage V variants in our future. With the parts in this box, you should be able to replicate a number of Mirage IIIE/R variants though you'll need to find aftermarket markings for many of the export operators not covered in this release.